We at Northerner want to make sure that you have a great shopping experience with us. 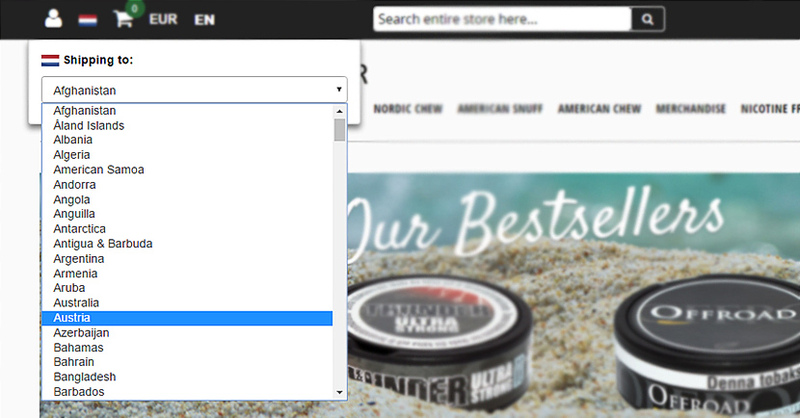 Therefore we have collected some questions that might come up when browsing for your favorite snus, snuff or chew. Basic info like shipping times can be viewed in our Terms & Conditions section. And in case you have a more specific question, our customer service team is always happy to assist you. You can reach them here. If your shopping cart is displayed as empty or some products are missing when you try to order them, double check that you have selected the correct shipping destination in the “shipping to”-menu, which can be found in the upper left corner on our website. This ensures that you will view all products available for shipping to your country. If you placed an order without logging in to a customer account, it is unfortunately not possible to link your order to an account afterwards. We recommend to place all your orders through a customer account so that you can follow the status of your order and receive the best customer discounts. You can create a customer account here. Once an order is in our system, the selected products cannot be changed manually afterwards. If you ordered a wrong product by accident, please contact our customer service – in case your order has not left our warehouse, we can cancel your order for you so that you can place a new one with the right products. We offer payment by bank transfer and credit card*. We can unfortunately not accept Paypal or cash payments. All orders need to be paid before they are shipped. Why can’t I select bank transfer as a payment option? Bank transfer payment can be selected for orders from 25.00 euros. Credit card payment can be chosen for any order. If you select payment by credit card, you will be instantly directed to the online payment process and can pay for your order right away. If you select payment by wire bank transfer, it is up to you when to pay for your order. Please keep in mind that your order will be processed and shipped once the payment has reached us. If you want to change your address, please contact our customer support team as soon as possible. Please note that we can only change the address as long as the order has not yet been shipped. We cannot change the country in retrospect due to strict tobacco regulations. From the moment your order leaves our warehouse (usually within 48 hours), estimated shipping times are 3 to 14 working days, depending on the destination. For more detailed info on shipping times, you can click here. Sometimes delays occur due to local customs or postal delays. If your parcel isn’t with you by the end of the estimated delivery times, please contact your local customs and post office to see if any packages are held under your name. If no further information can be obtained there, you can contact our customer support team for further assistance. If you select UPS shipping for your order, you receive a tracking number from UPS and can track your order. If you select default shipping your order is shipped with regular mail. There is unfortunately no tracking option. If you have a customer account, you can check the status of your order from the moment you place it until it leaves our warehouse. You can open an account here. We strongly recommend that you state a shipping address where you will be staying for at least 2 months after placing the order. Otherwise we can unfortunately not guarantee that you will receive your order in time since sometimes delivery times can be delayed due to customs or postal services which is beyond our control. We do not reship or refund orders which were sent to a temporary address. Why is my order split up in several shipments? Your order might contain products that are shipped from different warehouses (US & Sweden). From which warehouse a product is shipped depends on a range of tobacco regulations, it does not necessarily depend on your location. Due to regulations, products are sometimes shipped in batches of 5 or 10 cans in order to ensure that you receive your products without problems. The flag in the product display signals which warehouse a product is shipped from. If you live in Arkansas, Arizona, Georgia, Iowa, Maryland, Oklahoma, Oregon, South Dakota, Utah, Vermont, Washington or Wisconsin, we are unfortunately not allowed to sell tobacco to you. Its forbidden with online sales of tobacco in these states. Was my membership discount applied to my order? Membership discounts are not displayed separately. When you are a silver, gold or diamond member and log in to your customer account, you automatically see discounted prices for all products. Make sure to be logged in to your customer account in order to receive the discounts you’re eligible for. You might be trying to use a discount code that is not valid anymore or that has already been used to many times. Discount codes are not active during sales campaigns since all prices are already discounted and different discounts cannot be combined. Which customs duties and regulations apply to my order? Import fees and regulations differ between locations and may change over time. Often there are no additional fees. However, customs regulations are beyond our control. Since you as the importer are responsible to pay any potential additional fees, we recommend that you make yourself familiar with the regulations that apply to your location before you place an order with us. Can you mark my order as a present so I can avoid to pay taxes? We at Northerner play by the rules and can therefore unfortunately not mark your order as a present. We have to mark all packages with a specific product description and state the full product value.